A tasty and spectacular selection of fine cheeses, our Artisan Cheese hamper is wondrous delight and cannot fail to impress any cheese lover this Christmas! 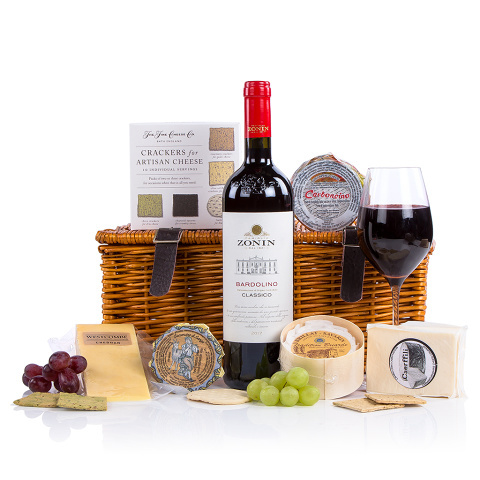 Only the very finest cheeses have made the grade, 5 stunning cheese have been partnered with a selection of Artisan cheese crackers and a bottle of Classico Bardolino, an ideal gift for those that love their cheese and wine around the season. Bocconcino Di Langa Cheese 80g ? Brillat Savarin Cheese 100g ? Carmarthenshire Caerphilly Cheese 200g ? The Fine Cheese Co. Crackers for Artisan Cheese 150g ?